The class begins Feb. 7, 2012 and meets for 75 minutes for six consecutive Tuesdays from 1 to 2:15 p.m. Eastern Time. 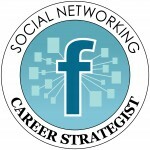 Did you know that Facebook is approaching LinkedIn in popularity as a recruiting tool? (According to a JobVite social media survey, 2011.) Yet many job seekers view Facebook as a waste of time. They're missing out on a valuable job search strategy and key component of their online identity and social media presence.